We've fixed the camera bug [Thank you Kyu]. The hero sometimes ends short before making to the bed. Hey You! 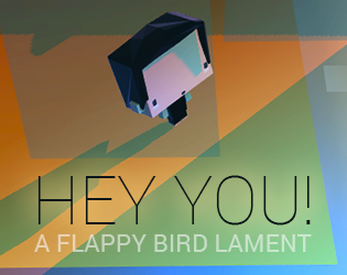 A Flappy Bird Lament is a music-video game by bitpop band 7bit Hero. It puts you in the shoes of Flappy Bird’s developer Dong Nguyen from the initial release of the game to his sleepless nights while witnessing threats, suspicions and hate, and eventually, to the deletion of his game. The game is matched with 7bit Hero’s lamenting new single, ‘Hey you!’, which acts as a soundtrack for this documentary-like music-video game. Navigate Dong Nguyen through his apartment at night and watch as actual twitter comments bombard you. Do you get caught up in the trolls’ hate? Or do you make it to the end and delete Flappy Bird, returning to a simpler life? Created by 7bit hero for flappy jam.